We are among the industry veterans, bringing forth Curvz Foam Soap Dispenser for our esteemed customers. The offered soap dispensers prevent the soap from getting contaminated by eliminating the need for it to be touched by the users. 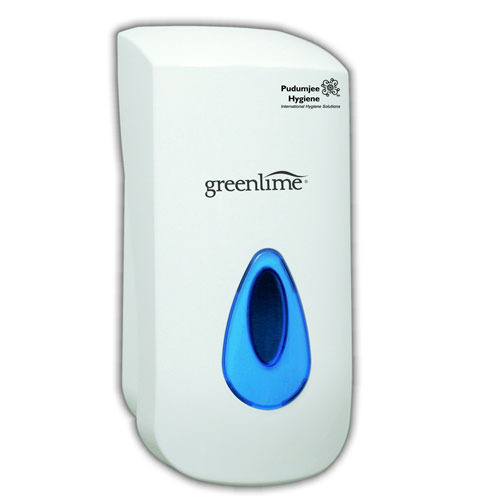 It is ergonomically designed and dispenses liquid soap in measured quantities to minimize wastage. Apart from promoting hygiene, these dispensers are regarded for their stylish appearance. Pudumjee Hygiene Products Limited, Pune, established in the year 2004, is among the topmost organization that deals in manufacturing and trading a wide array of Hygiene Products. Our product range includes Facial Tissues, Napkins & Serviettes and Toilet Roll Dispenser. The offered products are manufactured from high grade raw material that is procured from well known vendor. Furthermore, we have emerged as one of the leading manufacturers and traders of hand washers and cleaning equipment. Available with us at highly affordable market prices, the offered cleaning equipment are widely used in various hotels, restaurants, canteens, and food court. We are backed with sophisticated infrastructure that is required for large scale production. To ensure smooth operations, we have divided our infrastructure into various units. To ensure efficient handing of latest machinery, our organization has appointed highly experienced engineers and technicians. It is due to our spacious warehouse that we are able to store these products effectively. These products are available in bulk with standardized packaging that ensure delivery of hassle free product while transportation.